Emmanuel Macron was born in December 1977 in Amiens. He is a haut fonctionnaire (senior public official) specialising in economic affairs. He studied philosophy and was Paul Ricœur’s assistant for two years before attending the Ecole Nationale d’Administration (ENA) from where he graduated in 2004. Emmanuel Macron then joined the Inspectorate General of Finance (IGF) and, in 2007, became expert adviser to the head of department. In this capacity, he served as rapporteur for the Commission pour la libération de la croissance française (French Commission on Economic Growth), chaired by Jacques Attali. He then went to work in the banking industry. In 2011, he was involved in François Hollande’s campaign for the socialist party’s presidential primary and, subsequently, in the presidential campaign itself. During the latter campaign, he was tasked with coordinating a group of experts and with drawing up the candidate’s economic manifesto. In May 2012, he took up the position of Deputy Secretary General of the President’s Private Office with particular responsibility for monitoring strategy and economic affairs, and for overseeing fiscal, financial, tax and sector-based issues. 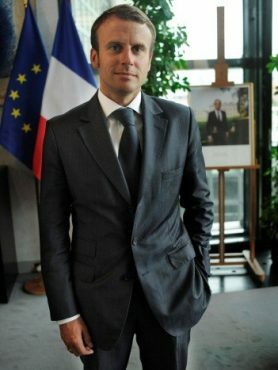 On 26 August 2014, Emmanuel Macron was appointed Minister for the Economy, Industry and Digital Affairs in the government headed up by Manuel Valls. His mandate is to ensure France’s economic recovery.